Divers are searching for submerged wreckage of the plane, along with flight-data and cockpit-voice recorders documenting the aircraft’s final moments. The accident is the first for Boeing’s most-advanced 737, which began flying for airlines last year, and is the worst commercial aviation disaster in three years. There were already hints of possible causes: a request by pilots to return to the airport, a maintenance issue on a previous flight and erratic air speed tracked before the jet’s final dive. But the limited and sometimes contradictory information about the flight doesn’t obviously match any previous accidents, said Steve Wallace, the former head of accident investigations at the US Federal Aviation Administration. “I have no most-likely scenario in my head for this accident," Wallace said. Indonesia’s rescue agency said it will deploy 14 ships and three helicopters in its efforts to locate the fuselage and help recover victims’ remains. It is scheduled to hold a briefing at 1 pm local time in Jakarta. Lion Air said late Monday night that they’ve recovered body parts in 24 bags. A team of investigators from the US National Transportation Safety Board, Boeing and engine maker CFM International —a joint venture of General Electric Co. and Safran SA—will assist a probe spearheaded by Indonesian authorities. 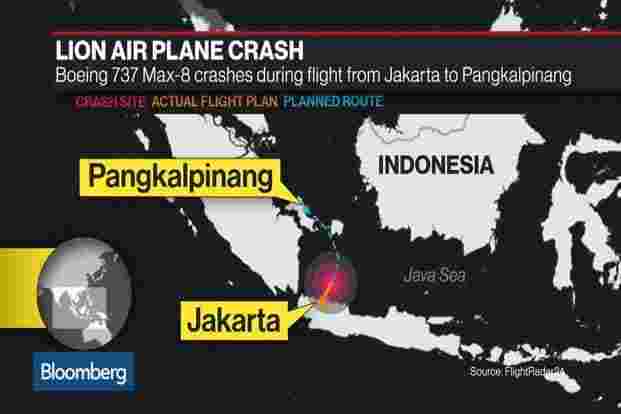 The two-month-old 737 Max 8, operating as Flight 610, took off from the capital Jakarta headed for the island tourist destination of Pangkalpinang, at 6:20 am local time Monday. Air-traffic controllers lost contact 13 minutes later when the plane was at an altitude of about 3,000 feet, according to Indonesia’s National Search and Rescue Agency. “This thing really comes unglued," John Cox, the president of consulting company Safety Operating Systems, who has participated in numerous crash investigations. “The numbers are barely believable." Boeing fell 6.6% to $335.59, the biggest drop since February 2016 on Monday. The decline was the largest on the 30-member Dow Jones Industrial Average, amid a broad rout of defence contractors and fears of a worsening trade war between the US and China. The US Federal Aviation Administration, which also audits safety in other countries, followed a similar track as Europe. It found that the country didn’t have adequate aviation laws and standards during the same 10-year period. The European Commission said there’d been “ no indication" that safety levels at Lion Air or safety oversight in Indonesia as a whole had deteriorated. The decision to remove Indonesian carriers from the banned list was taken in 2016 on the basis of expert analysis, Commission spokesman Enrico Brivio told reporters in Brussels on Monday.